The Family Table with Genevieve: Stranded! Well....I don't know about you, but I could use something other than politics to talk about today. So why not a little fashion! 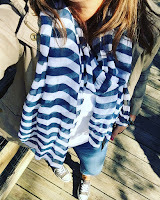 Today I am linking up with two of my favorite bloggers Mix & Match Mama and A Little Bit of Everything. These girls pick a fun topic each month that highlight items to take if you were to be stranded on a desert island. I love reading them and thought it would be fun to link up with them too! So here it goes... the 3 pieces of outerwear I could not live without! My denim jacket. I got it forever ago at Old Navy and it never goes out of style! I am sure they may have tweaked some of the styling over the years, but here's the link for their current style. It's perfect in the Spring, Summer and Fall. I have worn it to work, with shorts and it's perfect with a dress. I just love a good denim jacket!!! My olive military style jacket. This jacket is another piece I can wear multiple seasons. It is super soft and the color is a great neutral that you can wear with so many things! This was a steal at Marshall's....so glad I got it! I linked up a similar one here. My NorthFace Vest. This is my favorite thing to wear most of fall and winter. I don't like a lot of layers when I am out running errands or doing stuff with the kids and this is the perfect solution. It fits so nice and has deep pockets that zip, so I am never worried about losing my keys or phone. I just love this vest! Here's the link for this favorite vest! I have it in black.....I would love one in the Rabbit Grey too! Well I hope you enjoyed a little pop of fashion in the blog today. When I started writing I knew that most would be devoted to family and food... but I love to throw a little fashion in there now and again! Next month the girls are hosting their Stranded edition with the 3 Christmas Movies you could not live with out. That should be fun! Post your comments below with your favorite outerwear pieces! Holidays are coming and who doesn't love looking at recommendations for great pieces!!! Enjoy your Wednesday friends! We will be back on Friday with some tips on how to keep the kids' stuff organized! I don't know about you, but the papers that come home each day can get a little out of control! Hope to see you then..... there's always room for one more at our family table. Love all your choices - I definitely have my military jacket and vest picked too!